Allegations of tire-soaking and tire-swapping at Montgomery Motor Speedway ran rampant throughout the pit area shortly after qualifying. And all the fingers were pointing at the 5-team (the eventual winners) and its owner Richie Wauters. “The guy from the 5-car said, ‘Yeah, we brought them from Wisconsin.’ Well, the rules say you cannot have brand new tires in your pit area. You have six tires and they have to come out of the impound area (at the track). “They do have new soak that’s not detectable by smell and it does not change the durometer reading and they ain’t got nothing here to check it with,” said Reno’s friend Tommy McCoy. That’s one side of the story, now the other side. Did the 5-team soak their tires? Dennis Reno was not happy. 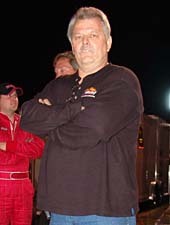 “If he was messin’ with us, he did a pretty good job of it, didn’t he?” Thos were the words of Tracy Goodson, car owner for Ronnie Sanders, who was parked right next to the 5-team. “I know they was playing with them, but I’m not the one that ran and told the officials,” continued Goodson. “There was about five team owners near the pit talking about it, but I don’t know if they were soaked or not. 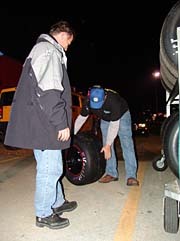 The game got several people ticked off and Wauters was forced to switch to four new tires, ones that came off his tire rack, before the start of the race. “He (the track owner Bill Manfull) just does not know what he is messin’ with at Montgomery,” added McCoy. “This is the clan-nish town. He’s done a good job don’t get me wrong; everything looks nice, but his priority is in the wrong place. He better take care of the cars because there ain’t a lot of them around. That next race is April 9th. The verdict is still out on many matters. Will the cars show up? Speed51.com says yes because the track is paying a good purse. Were the tires soaked or was Wauters just playing with everybody? That is for you to decide. We asked Reno if he was sure the team swapped tires and if the ones that were put on the car were soaks. 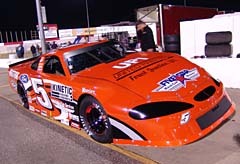 “It is the competitors allegations that the ones that are on the car now are from the impound area,” concluded Montgomery Motor Speedway Tech official Glenn Frazier. The problem with racing is that sometimes perception becomes reality and whether or not the 5-team was soaking tires is not the main concern for the track’s future.